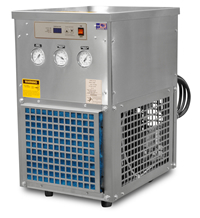 Advantage manufacturer application specific portable chiller that are designed to provide the unique cooling needs or EDM machines. M1-1ARX-CH chillers include an internal pump system to draw fluid from the EDM machine reservoir. An internal reservoir in not included. Portable chillers can be moved between use points as needed. Air-Cooled chillers use indoor ambient air to cool the process load. 2. Capacities may be +/- 5% as reserved by the compressor manufacturer. Operating at temperatures below 50° will reduce chiller capacity. The minimum recommended operating temperature when no glycol is used is 48°F. 5. Consult factory for 50hz operation. 6. Approximate unit weight crated for shipment. Free preventative maintenance check in the 2nd year.